Vinex EduBeanz® a new innovation from Vinex. These bean bags are printed with 12 different pictures of basic vegetables in single colour to teach the students names of vegetables by way of fun games / activities. 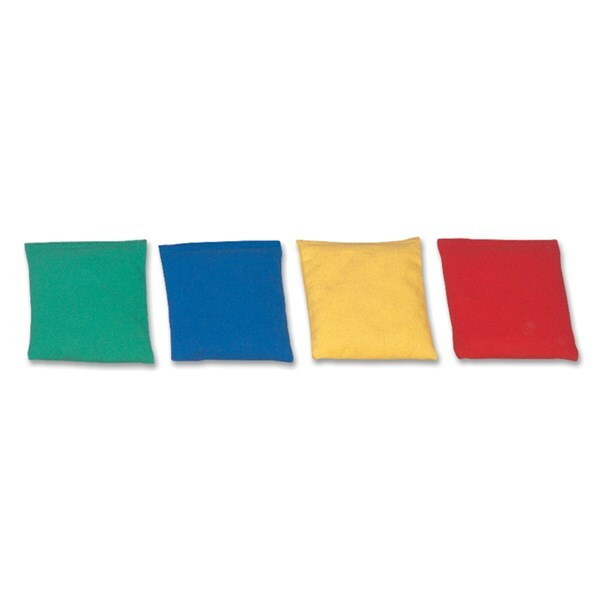 Bean bags are made of cotton & filled with plastic pellets. Set consists of 12 bean bags, comes with a mesh bag. Vinex EduBeanz a new innovation from Vinex. 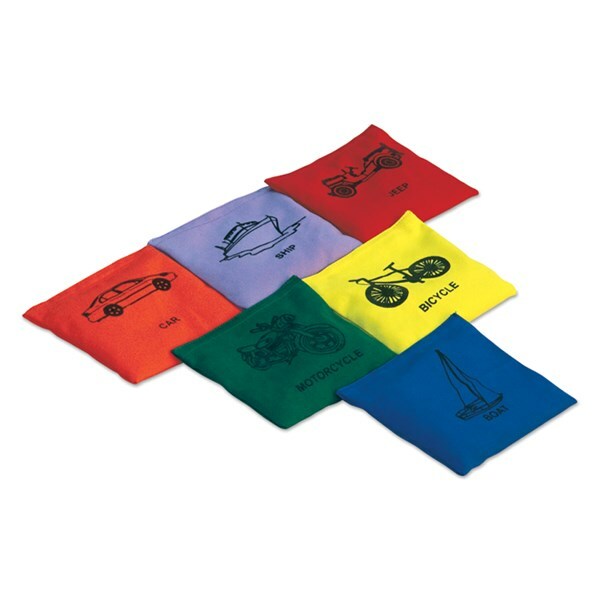 These bean bags are printed with 12 different pictures of basic transport in single colour to teach the students names of different types of transport by way of fun games / activities. Bean bags are made of cotton & filled with plastic pellets. 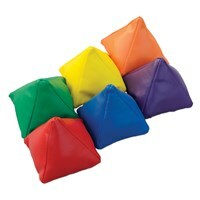 Set consists of 12 bean bags, comes with a mesh bag. 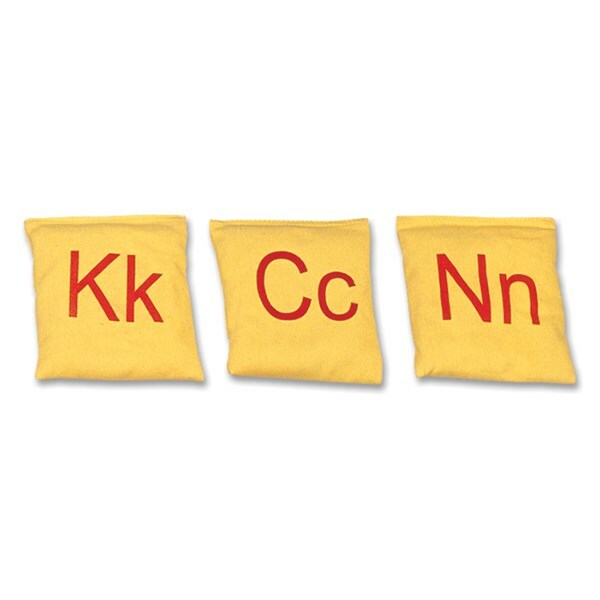 Bean bags made of cotton cloth with "A-Z" alphabet printing. 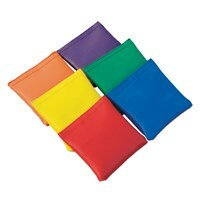 Set of 26 bean bags available in four different colours (Red / Blue / Green / Yellow) filled with plastic pellets. A perfect way of learning while playing. Single side and both sides printing options available. Size : 4.5" square. More colours are also available on request. BBP-C45A ...... ...... Bean bag made of cotton cloth single side printing. BBP-N45A ...... ...... Bean bag made of nylon cloth single side printing. Bean bag made of cotton cloth with corresponding colour name of the bean bag. Available in different colours (as per requirement). Filled with plastic pellets. A perfect way of learning while playing. Single side and both sides printing options available. Size : 4.5" square. BBP-C45C ...... ...... Bean bag made of cotton cloth single side printing. BBP-N45C ...... ...... Bean bag made of nylon cloth single side printing. Bean bag made of cotton cloth of corresponding shape with its shape and name printed on the bean bag. Available in different colours (Red / Blue / Green / Yellow). 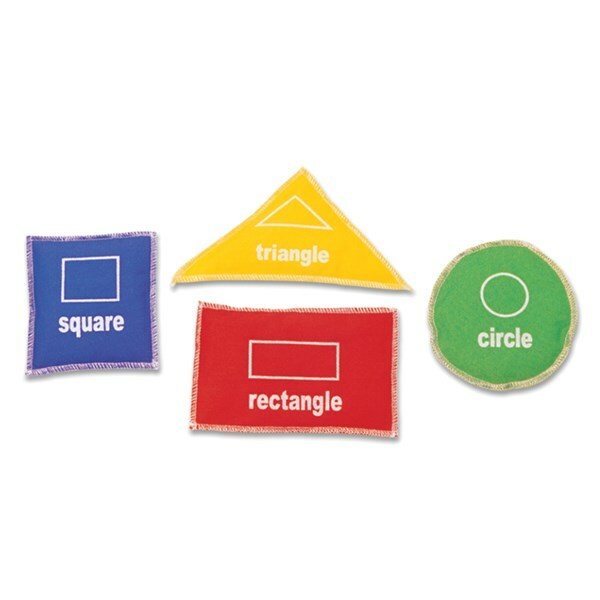 A set consists of 4 bean bags (1 square, 1 triangle, 1 rectangle & 1 circle). A perfect way of learning while playing. Single side and both sides printing options available. More colours are also available on request. BBP-CCS4 ...... ...... Bean bag made of cotton cloth single side printing. 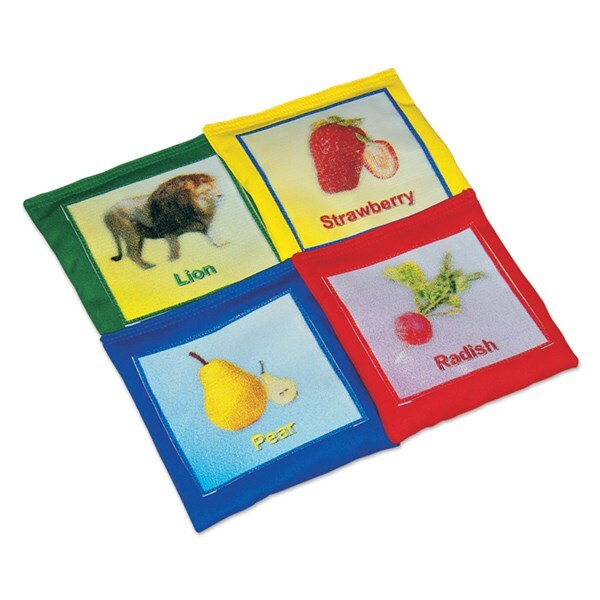 Bean bag made of cotton cloth 4.5" square filled with plastic pellets, printed with different shapes. 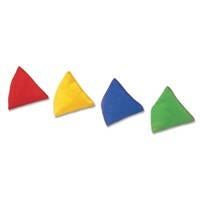 Set of 7 different shapes. Available in different colours (Red / Blue / Green / Yellow). Single side and both sides printing options available. BBP-C45S7 ...... ...... Bean bag made of cotton cloth single side printing. 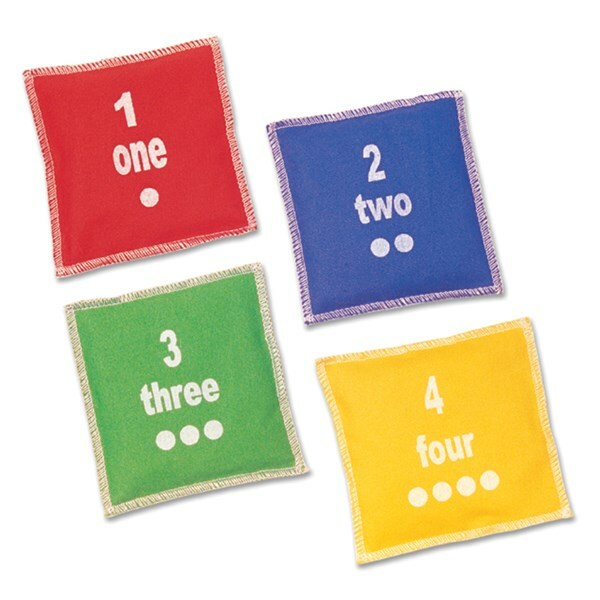 Bean bag made of cotton cloth 4.5" square with "1-10" and corresponding dots printed according to the numbers. 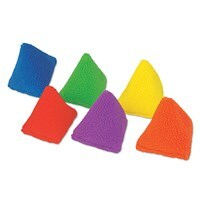 Set consists of 10 bean bags filled with plastic pellets. Available in four different colours (Red / Blue / Green / Yellow). A perfect way of learning while playing. Single side and both sides printing options available. BBP-C45S10 ...... ...... Bean bag made of cotton cloth single side printing. 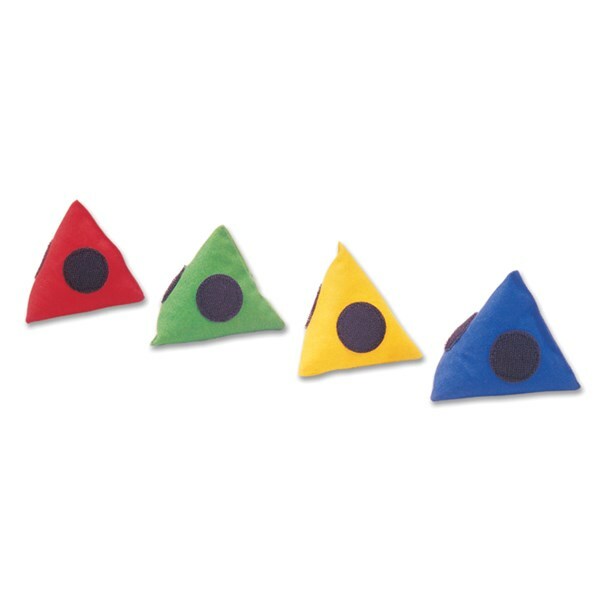 A new uniquely designed pyramid shaped bean bag, made of thick cotton cloth. Its exclusive design makes this bean bag to fall always on its face side, does not matter from whichever side you throw. Each face is stitched with round shaped velcro. A new uniquely designed pyramid shaped bean bag, made of thick cotton cloth. Its exclusive design makes this bean bag to fall always on its face side, does not matter from whichever side you throw. Made of soft synthetic fabric. Look and feels like a fleece. Available in different sizes and colours. Pyramid bean bag made of soft PU fabric, filled with poly fiber. Available in assorted colours (Blue, Green, Orange, Purple, Red and Yellow). Made of thick cotton cloth filled with plastic pellets. Available in different sizes and colours. Bean bag made of soft PU fabric with reinforced stitching and filled with plastic pellets. Available in assorted colours. Bean bags made of cotton cloth with alphabets "A-Z" printed along with the words starting with the letters & corresponding pictures to the words. 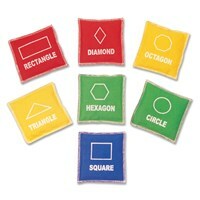 Set of 26 bean bags. Filled with plastic pellets. A perfect way of learning while playing. Single side printing. 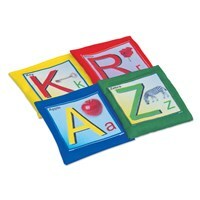 Size: 12 cm x 12 cm & Weight: 110 gm. 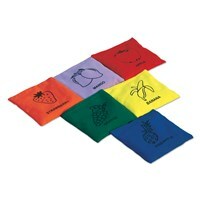 Bean bags made of cotton cloth with pictures of fruits and their names printed. Filled with plastic pellets. A perfect way of learning while playing. Single side printing. Bean bags made of cotton cloth with pictures of animals and their names printed. Filled with plastic pellets. A perfect way of learning while playing. Single side printing. 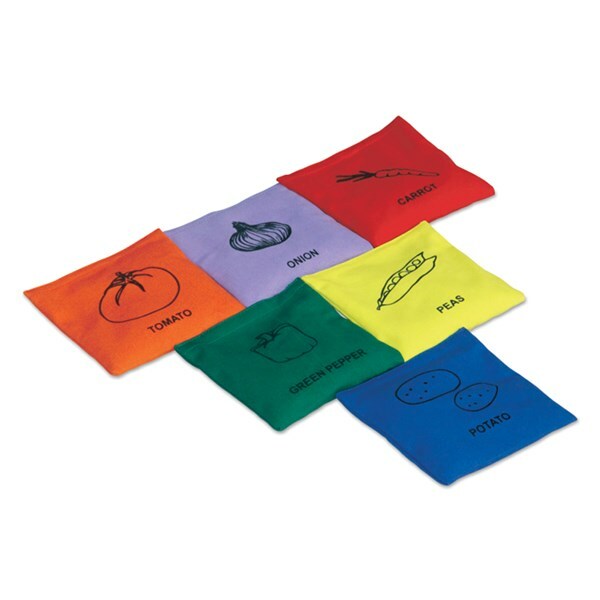 Bean bags made of cotton cloth with pictures of vegetables and their names printed. Filled with plastic pellets. A perfect way of learning while playing. Single side printing. 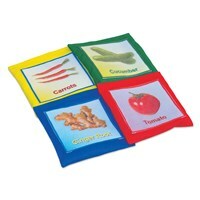 Bean bags made of cotton cloth with pictures of fruits, vegetables & animals and their names printed. Filled with plastic pellets. A perfect way of learning while playing. Single side printing. 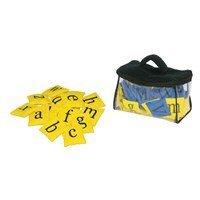 Available in pack of 18 pcs (6 pcs of each category) and 36 pcs (6 pcs of each category). Vinex EduBeanz a new innovation from Vinex. These bean bags are printed with 12 different pictures of basic fruits in single colour to teach the students names of basic fruits by way of fun games / activities. 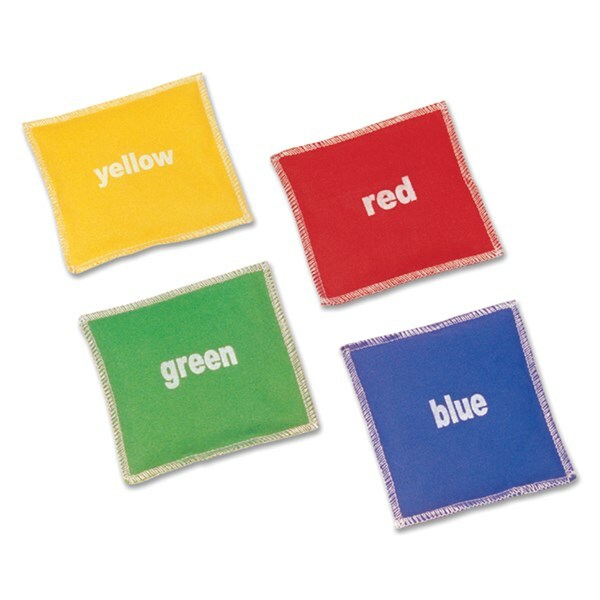 Bean bags are made of cotton & filled with plastic pellets. Set consists of 12 bean bags, comes with a mesh bag. 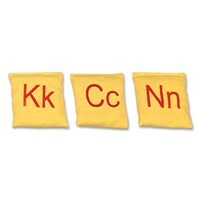 Bean bags made of cotton cloth with "A - Z" alphabet printing. Set of 52 bean bags with 26 Small letters print and 26 Capital letters print. Available in assorted colours, filled with plastic pellets. 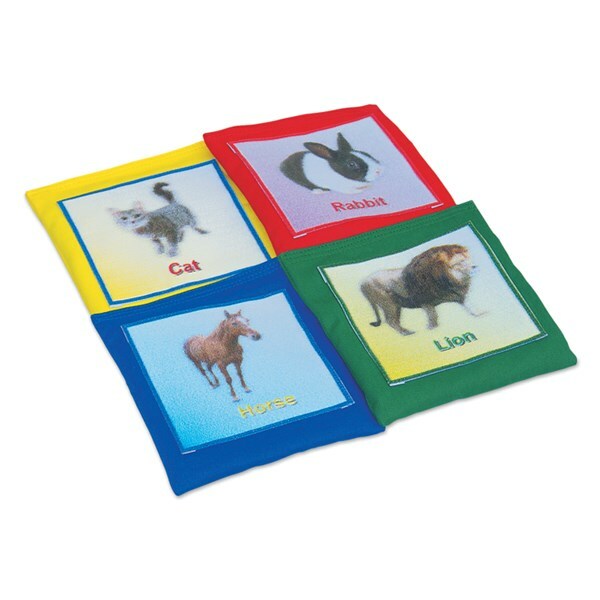 A perfect way of learning while playing. Single side printing. Size: 7cm square. Please confirm colour while ordering.